First, decide how many apples you need. One apple yields about 2-3 kid-sized snack servings. Generally you will need one to one and a half sliced apples per cookie sheet. I would recommend making a batch of at least 2 cookie sheet’s worth. Wash your apples, especially if you are not peeling them. Peeling is optional. Organic apples are also recommended. Luckily, many local options can still be found at farmer’s markets throughout the country even at this time of year. Preheat oven to 200 degrees. 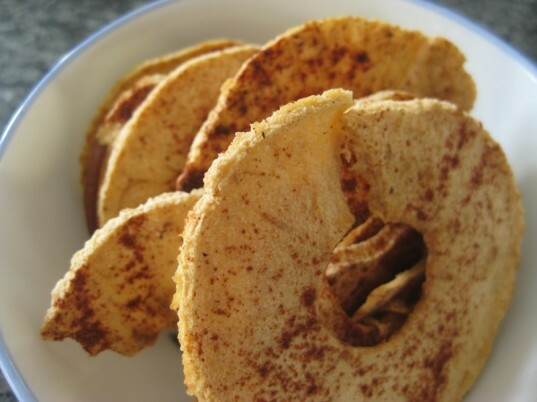 Lay apple slices in one layer on the cookie sheet. It’s okay if they touch a little bit, but do not overlap them. 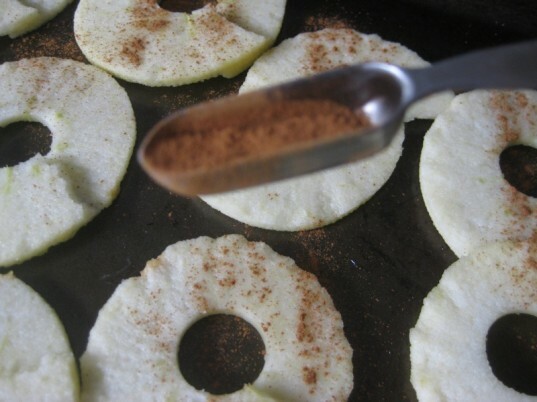 Sprinkle with cinnamon or another spice of your choice. I used 1/2 tsp cinnamon for 1 apple. I also added several dashes of nutmeg. Allspice is also a good option. 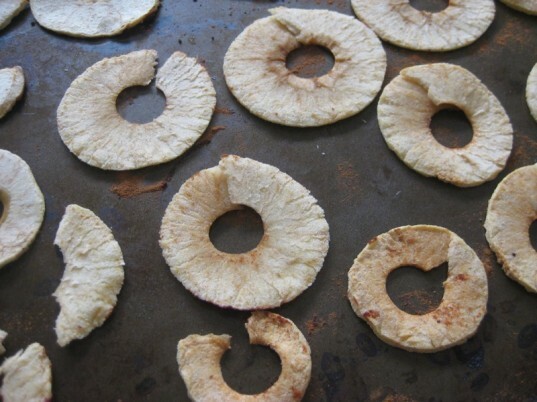 They will reach the crunchy “apple chip” texture at around 2 hours, but, depending on your oven, this may be achieved between 1 hour and 45 minutes to 2 hours and 15 minutes. 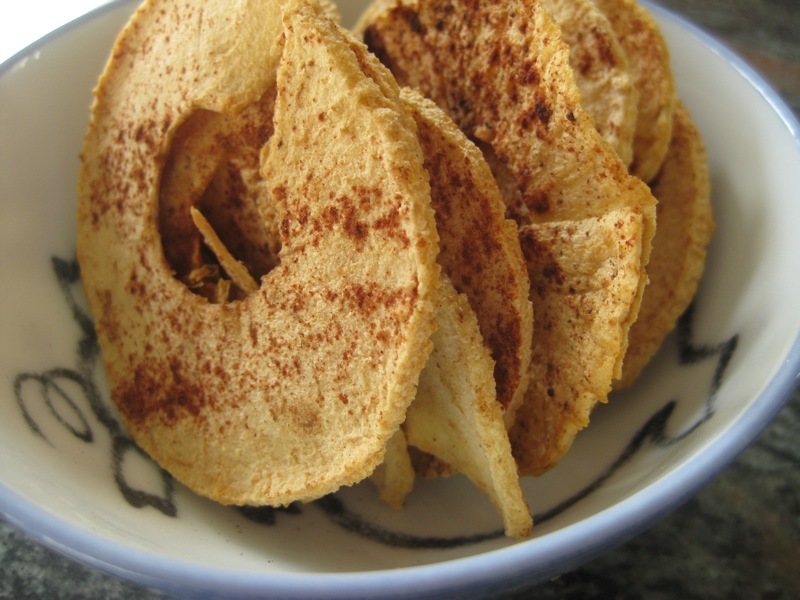 As a side note, they are also yummy simply as dried apple slices that can be added to cereal or oatmeal: to be used as such, pull them out around 1 hour and 30 minutes. Let cool and then enjoy immediately or pack up for a superb snack! 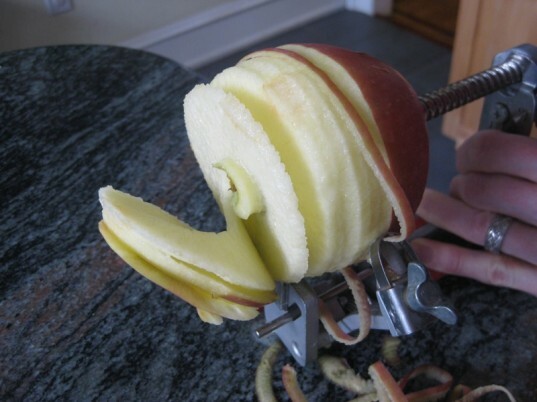 First, decide how many apples you need. One apple yields about 2-3 kid-sized snack servings. 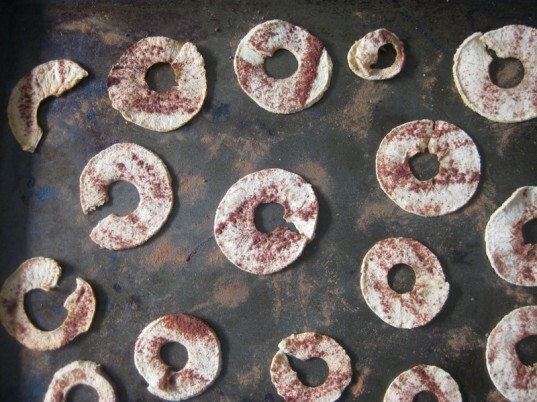 Generally, you will need one to one and a half sliced apples per cookie sheet. I would recommend making a batch of at least 2 cookie sheet's worth. 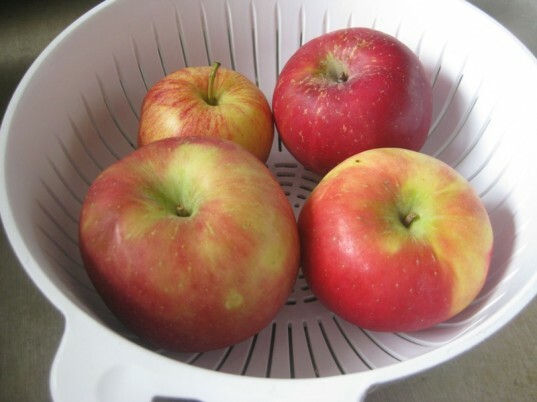 Wash your apples, especially if you are not peeling them. Peeling is optional. Organic apples are also recommended. Luckily, many local options can still be found at farmer's markets throughout the country even at this time of year.